Mechanical stress application is a unique method for bone studies. 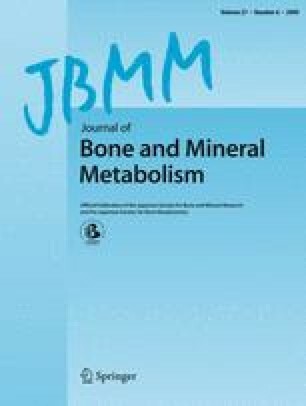 We have reported regulation via the p38 mitogen-activated protein kinase (MAPK) pathway in osteoblasts under application of cyclic tensile strain (CTS), among many reports on the extracellular signal-regulated kinase (ERK) 1/2 pathway during mechanical stress, and questions remain as to the differences between our findings and those of others regarding types of MAPK activation. In the present study, osteoblasts were used after the third passage and stimulated by the application of 7%, 0.25 Hz CTS for 3 days, 4 h/day. CTS-induced osteoprotegerin (OPG) synthesis in osteoblasts increased at the third passage and decreased at the fifth passage, whereas CTS-induced receptor activator of nuclear factor-κB ligand (RANKL) mRNA expression decreased in osteoblasts at the third passage and increased at the fifth passage. Increases in CTS-induced osteopontin (OPN) synthesis, cyclooxygenase-2 (Cox-2) mRNA expression, and nitric oxide (NO) production by osteoblasts did not change at the third and fifth passages. Furthermore, p38 MAPK at the third passage and ERK1/2 at the fifth passage were found to be competitively activated in osteoblasts by the application of CTS. Based on these results, osteoblasts were shown to be affected by the number of passages. It was suggested that the examination of passage-affected characteristics of osteoblasts might not only be pertinent to the analysis of cellular senescence and in vivo models of bone remodelling with aging but could also be useful in the development of bone tissue engineering. I thank Dr. Hirotaka Sakaki, D.D.S., Ph.D., Department of Dentistry and Oral Surgery, Hirosaki University Graduate School of Medicine, and Dr. Shigetada Kawabata, D.D.S., Ph.D., Department of Oral and Molecular Microbiology, Osaka University Graduate School of Dentistry, for helpful suggestions and comments. This work was supported by Grants-in-Aid for Scientific Research (C) (Nos. 17592063, 19500558, 19592280, 20590532) from the Japan Society for the Promotion of Science (JSPS).